Shift paddles are located behind the steering wheel, although you’ll feel every upshift and downshift and the result can feel occasionally clunky. Our tester’s steering was fairly vague, even in Sport mode, and touchy brakes took getting used to. True to its target, this MKX is not a sporty performer. That’s a shame, given how well the MKC sheds perception of the brand’s dowdiness. “This baby cruises down the road with the best out there in terms of quietness and smoothness. The X really shines on the freeway, where there’s little to no tire and/or wind noise -- at 70, 75, 80 mph. The thing is whisper quiet, quieter than most other SUVs we can think of. Sound-deadening efforts such as active-noise control and laminated glass really paid off. It’s calming. Meanwhile, the 2.7-liter EcoBoost six delivered a nice mix of throttle response, refinement and power. Lincoln claims 26 mpg on the highway, and while we didn’t measure highway mileage exclusively, we averaged almost 19 mpg in a city/hwy combo over a few days of driving. The drive modes -- normal, sport and comfort -- do indeed make a difference, performing as they’re labeled, adjusting suspension and steering effort. We found the softer comfort mode best around Detroit’s pockmarked streets, while normal or sport worked best on the freeway. In all modes, body roll is decently minimal, steering fairly communicative. There’s an auto hold function that, as Lincoln says, “relieves the driver from having to press the brake pedal continuously to keep the vehicle stationary in traffic.” Ooookay. Didn’t know holding the brake with one’s foot was such a chore, but there you have it. “There’s an impressive absence of road, tire, and wind noise -- until the big, 20-inch wheels and tires roll over potholes and expansion strips. The MKX being so quiet and smooth makes the tire-thump sound and the body shimmy over road imperfections that much more intrusive. Steering is light and fairly unobtrusive, with the right level of directness for a big, tall vehicle. 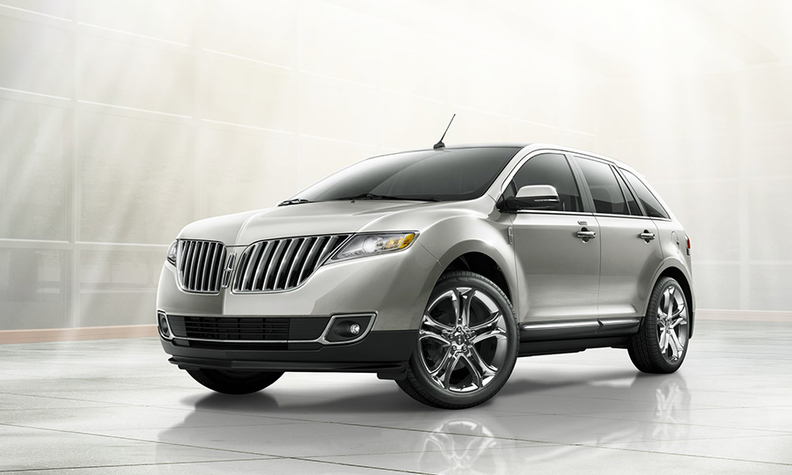 The 2016 Lincoln MKX’s Lincoln Drive Control offers Normal, Comfort, and Sport settings for the engine, transmission, body, and chassis. With everything in Sport mode, we sped up a freeway off-ramp in Metro Detroit and found body roll to be controlled and minimal for a CUV this size, and the big tires paid off with their admirable grip, holding securely as the mild understeer overcame the chassis mid-ramp. “Within the first quarter mile on the road you’ll realize that this isn’t your grandmother’s Lincoln. The small-displacement 2.7-liter turbo pulls like a freight train. Effortless, punchy and refined, it supplies enough forward thrust to warm the heart. The only powertrain item that falls a little short of current standards is the six-speed automatic, which can be caught off-guard, occasionally bumping into gear in a rather ungracious way. When it comes to carving corners, the 2016 Lincoln MKX proved taut and agile, with a tied-down feel that’s enjoyable and confidence inspiring. This shouldn’t be a total surprise since the platform is derived from the fun-to-drive Fusion sedan. Even when driven with extra gusto at our track, the MKX kept its composure. Ride comfort is impressive, as well. The 2016 Lincoln MKX feels planted and steady. Even with its 20-inch wheels, bumps and ruts are nicely muted and the cabin stays quiet and tranquil. Another focus of the brand recast has been spiffing up the interiors. In this car that means you’ll find a super-swanky, high society hunt-club atmosphere here, with leather on the dashboard, a suede headliner, and big chunks of Chilean maple. The furniture includes comfortable, supportive, heated and ventilated seats front and rear. A super-sized glass sunroof brightens the interior. The utility part of the equation is addressed with big doors, easy access, spacious rear seat, and plenty of cargo room. A power liftgate and power-folding rear seats lend a helping hand. “Want to know what it feels like to drive? Ever driven a Ford SUV, like the Explorer? Like that. It’s fine, like a competent cashier at a 7-Eleven. You say hey, you swipe, you sign, and you’re out. It barely registers as a transaction of any kind.